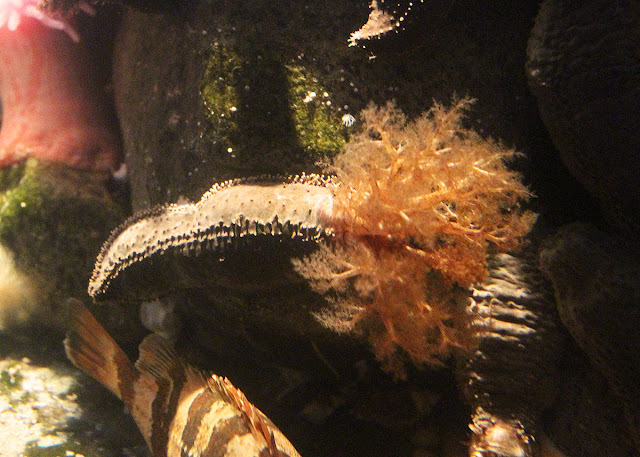 Our new Olympic Coast exhibit features marine animals native to the rugged coastline of Washington State in the Olympic Coast National Marine Sanctuary. 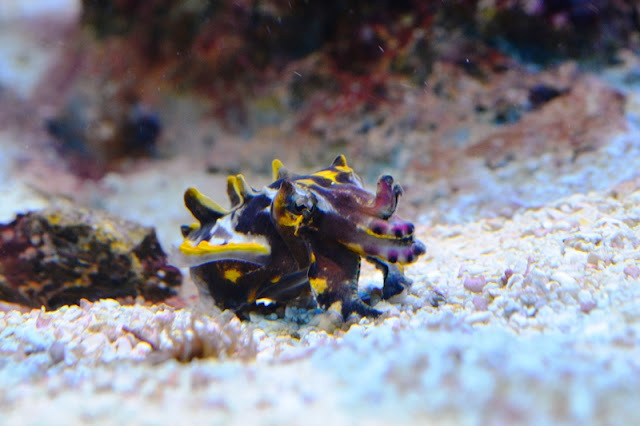 From giant Pacific octopuses to rockfish to swaying anemones, the exhibit dazzles with bright colors and movement. It's fascinating to compare these residents with their East Coast counterparts just steps away in the Gulf of Maine exhibits! 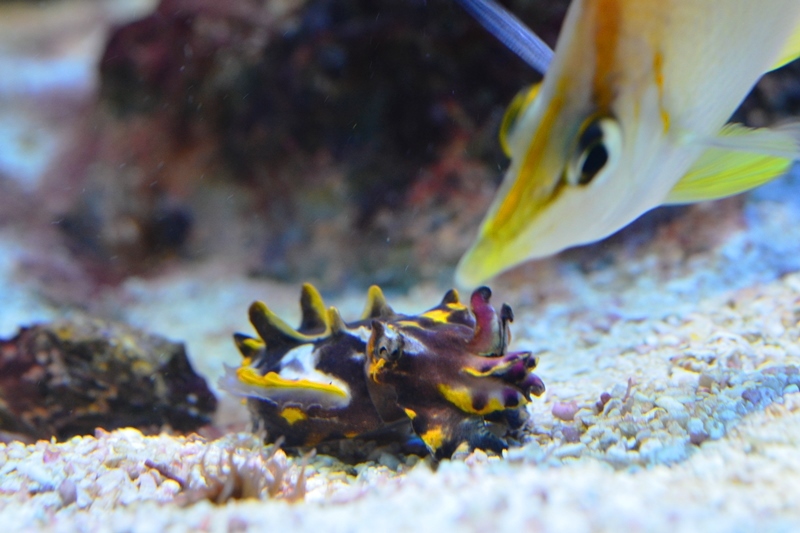 Both live in colder water, but many are wildly different. Olympic Coast exhibit, can you spot any cucumbers? Let's take a pair of similar — and, perhaps, under-appreciated — residents from both exhibits and compare. 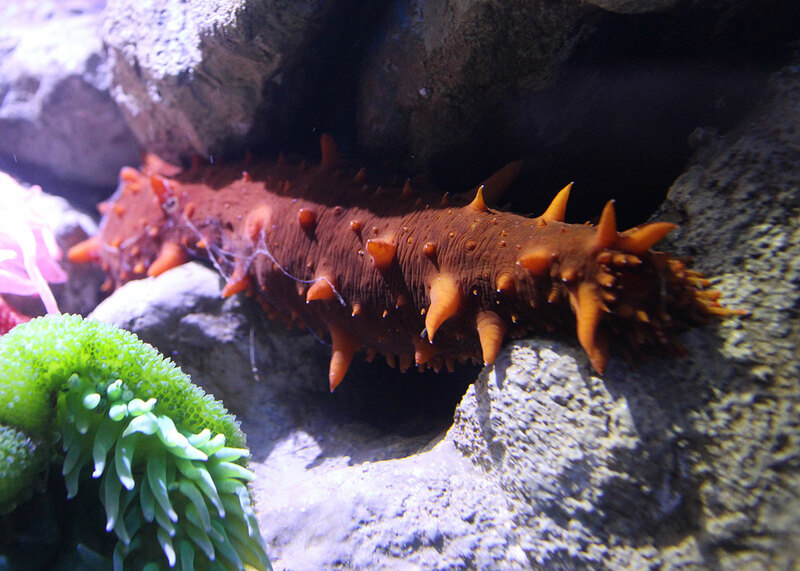 Meet, the sea cucumbers! 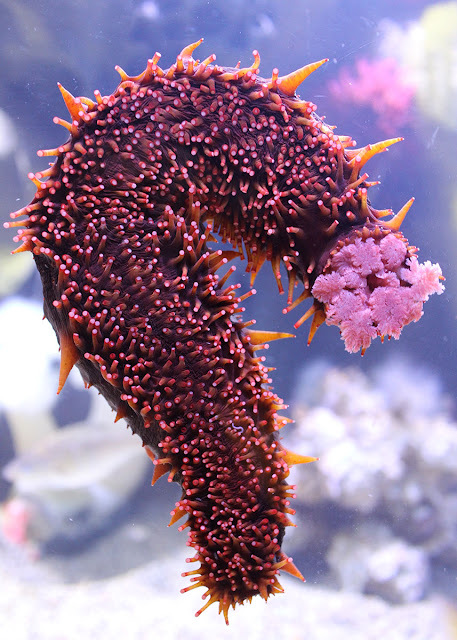 There are hundreds of species of sea cucumber, and the ones you find in our local waters have significant differences from ones you'll find along the Olympic Coast. 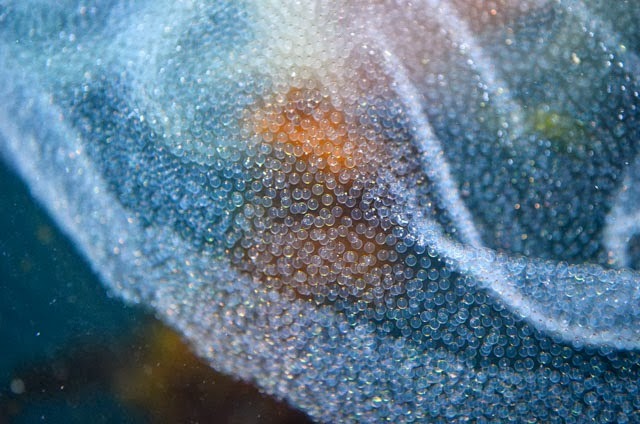 In this image you're looking at its undersides, which is a jumble of tube feet. 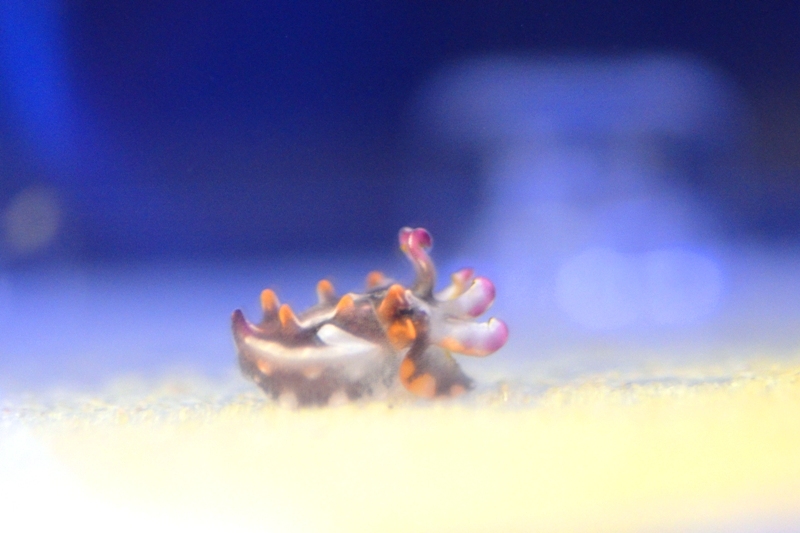 These tube feet help this animal cling to surfaces and (slowly) navigate coastal habitats from Baja, Mexico, to mid-Alaska. Sea stars and urchins also have tube feet. The shock of pink at one end is its mouth surrounded modified tentacles that sift through sediment as it creeps along the seafloor — or along the crystalline glass of the new exhibit. The back of the California cucumbers are leathery brownish, orange color studded with soft spikes. These invertebrates can grow to an impressive length of 40 cm (1 ft 4 in). Now to East Coast to meet the orange-footed sea cucumber (Cucumaria frondosa). The East Coast sea cucumbers that you might find in the Stellwagen Bank National Marine Sanctuary feature five orderly rows of tube feet around their entire cylindrical body. They serve the same purpose: to get around and cling to surfaces. The feathery appendages are those modified tentacles on the mouth-end of the animal. Unlike their West Coast cousins that have downward-facing tentacles that graze along the seafloor, the tentacles of the orange-footed cucumbers are flayed out in the currents to ensnare passing plankton. 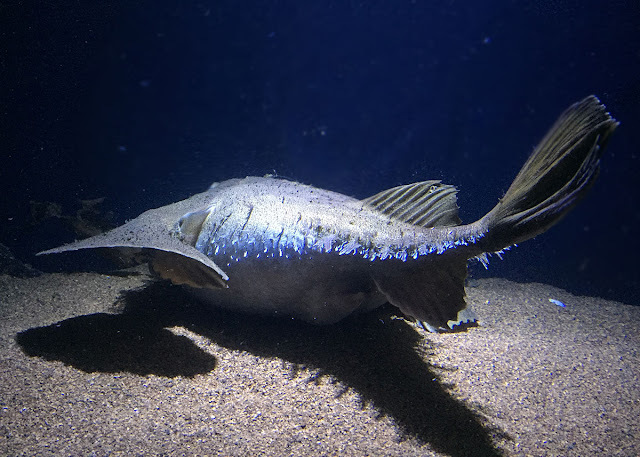 This species maxes out at 20 cm (8 in) and found in the North Atlantic Ocean all the way up to the Barents Sea (near Norway and northeastern Russia). East Coast: Orange footed cucumbers also have lines of tube feet on their back. This helps grab on to any surface, above or below. Also note the fringe of feeding tentacles. Sea cucumbers are not the only animals you'll encounter in our Northern Waters gallery. Hardly! 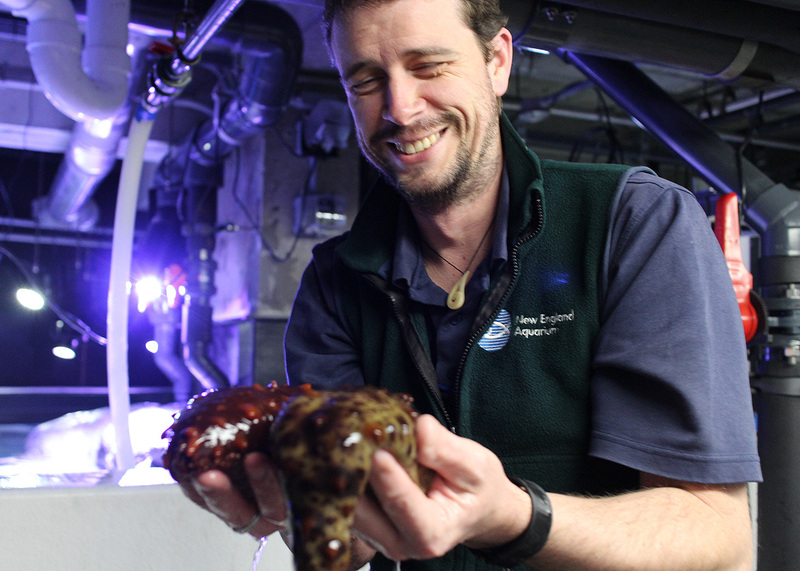 Come visit and meet the giant Pacific octopus that inhabit the new Olympic Coast exhibit near the California sea cucumbers. 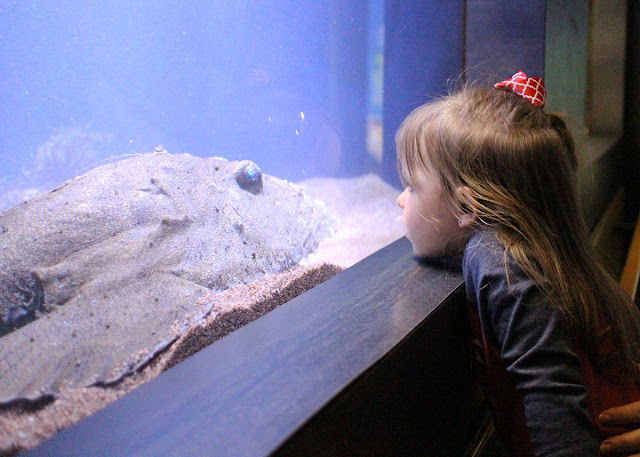 Then saunter down to take a look at the goosefish and lobsters in the boulder reef of the Gulf of Maine exhibits. 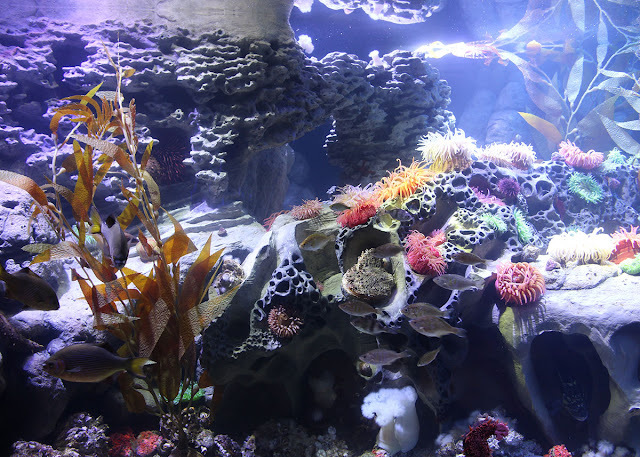 The Aquarium is a great place to explore our blue planet — from East Coast to West! from their transport container to the new Olympic Coast exhibit. Our beloved goosefish has done it again. She's spun a gossamer shroud of eggs that is currently billowing through her exhibit. A million eggs woven together in a single sheet 60 feet long and only a single egg thick. A natural masterpiece! The aquarists can always tell when the goosefish is about to lay another egg veil. Look how fat she was! She looked much more comfortable after the eggs arrived, sitting flat on the bottom as she usually does. 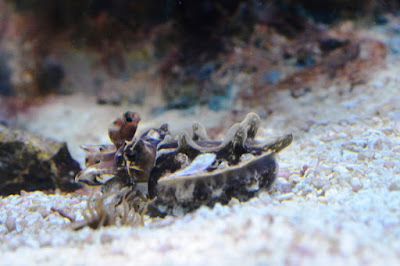 Without a male in the exhibit, the eggs aren't fertilized, so no baby goosefish. But the veil will remain in the exhibit with her for a couple days. After that it starts to fall apart and the aquarists remove it from the exhibit. Plan a visit soon because this beautiful event (usually) happens only once a year and it's exquisite. 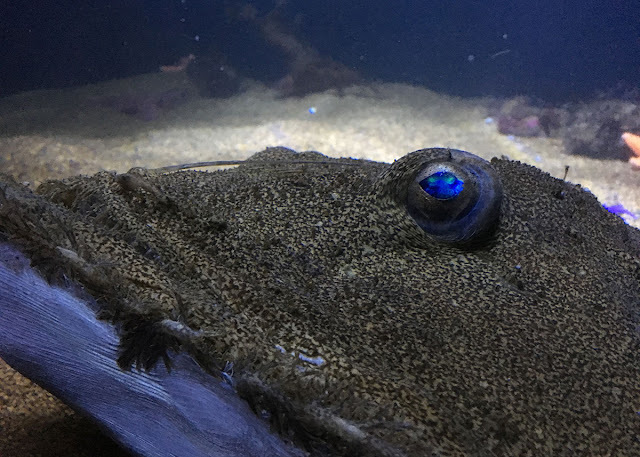 Bill expects Collette (yup, the goosefish has a name) to be pretty hungry over the next couple days after all that work of producing the eggs. Besides admiring the egg veil, don't forget to take a close look at this pretty lady! She has an enormous mouth, a fishing "lure," and intricate skin fringing her body. We never tire of the goosefish and her natural masterpiece. In fact, previous egg veils have also been well documented. Take a look back at some of her previous works of art.